All electrical connections must be contained in accessible electrical boxes. This is an example of handyman wiring that could be a potential safety hazard. If these connections were to fail, there would be no box to help reduce the chance of fire. We uncover 'handyman wiring' all the time. 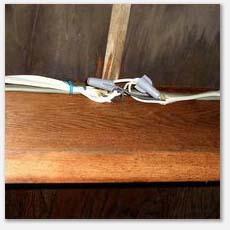 When this kind of connection is noted, we always are suspicious that there are more questionable electrical work in other locations of the home. At a minimum we can be sure this was not done with a permit, never inspected by a municipal inspector and it is highly unlikely that a licensed electrician did it. We are not saying this should prevent a buyer from purchasing this home, but a buyer should know that they are getting a less then professional and possibly hazardous electrical system. See our sample electrical report here. NEC 110.14 Splices shall be made with an approved splice cap or “wire nut” and shall be made in approved electrical boxes or enclosures.